Abstract: Gemstone minerals in Serbia have never been regarded as an interesting and significant resource. Nevertheless, more than 150 deposits and occurrences have been recorded and some of them preliminarily explored in the last 50 years. The majority of deposits and occurrences are located within the Serbo-Macedonian metallogenic province and the most significant metallogenic units at the existing level of knowledge are the Fruška Gora ore district, Cer ore district, Šumadija metallogenic zone, Kopaonik metallogenic zone and Lece-Halkidiki metallogenic zone. The most important genetic type of deposits is hydrothermal, particularly in case of serpentinite/peridotite as host/parent rock. Placer deposits are also economically important. The dominant gemstones are silica minerals: chalcedony (chrysoprase, carnelian, bluish chalcedony etc. ), jasper (picture, landscape, red etc. ), common opal (dendritic, green, milky white etc. ), silica masses (undivided), and quartz (rock crystal, amethyst etc.). Beside silica minerals significant gemstones in Serbia include also beryl (aquamarine), garnet (almandine and pyrope), tourmaline, fluorite, rhodochrosite, carbonate-silica breccia, carbonate-silica onyx, silicified wood, howlite, serpentinite, marble onyx, and kyanite. This paper aims to present an overview of Serbian gemstone deposits and occurrences and their position based on a simplified gemstone metallogenic map of Serbia, as well as genetic-industrial classification of gemstone deposits and gemstone varieties. Abstract: During the Late Cretaceous to Palaeogene, the Magura Basin was supplied by clastic material from source areas situated on the northern and southern margins of the basin, which do not outcrop on the surface at present. The northern source area is traditionally connected with the Silesian Ridge, whereas the position of the southern one is still under discussion. A source area situated SE of the Magura Basin supplied the Eocene pebbly para-conglomerates containing partly exotic material. The studied clastic material contains fragments of crystalline rocks, and frequent clasts of Mesozoic to Palaeogene deep and shallow-water limestones. Numerous mica schists, scarce volcanites and granitoids as well as gneisses, quartzites and cataclasites were found in the group of crystalline exotic pebbles. Monazite ages of “exotic” mica-schist pebbles from the Tylicz, Zarzecze and Piwniczna-Mniszek sections document the Variscan 310±10 Ma age of metamorphic processes. The provenance of these exotic rocks could be connected with a remote source area located SE of the Magura Basin, which could be the NW part of the Dacia Mega Unit. The idea is strongly supported by palaeotransport directions from the SE, the absence of material derived from the Pieniny Klippen Belt, the presence of shallow water limestones, typical facies of the Median Dacides belt and metamorphic age distribution proved by monazite dating. Abstract: This contribution presents the results of profile in-situ gamma spectrometry measurements that sought to determine the content of natural radionuclides 40K, 238U and 232Th in a near surface horizon of rocks, their weathering cover and soils in the area of the Malé Karpaty Mts. It is widely established that the exploration of radioactivity of bedrocks and cover rocks can be a very effective and useful tool for both geological mapping, for identifying deposits of mineral resources, and even addressing the issues of structural and tectonic geology. This assertion is equally confirmed by the ground gamma spectrometry measurements carried out as part of this case study on larger scales, seeking more detailed geological structure solutions. The results obtained provide a welcome addition to an already existing database, which monitors the content of naturally occurring radionuclides individually for every rock lithotype of the Western Carpathians, by elaborating on the data collected by previous research and by updating this database for any future needs. The presented results confirmed the low to medium radioactivity levels of rocks and soils in the studied area. 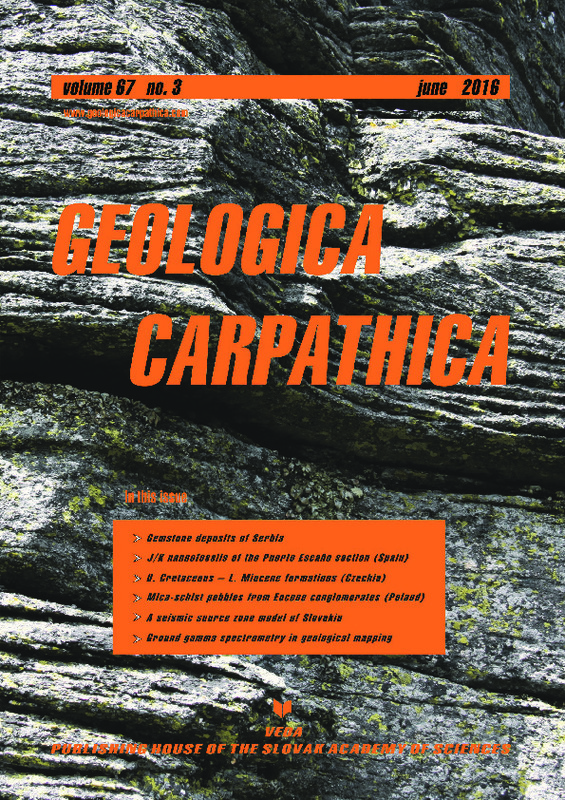 The highest values were detected in granitoids and metamorfic phyllitic rocks of the Malé Karpaty Mts. core; the lowest values were detected in carbonates, arenaceous sediments and, above all, amphibolite bodies. In this way, the presented results of the interpreted profile (P5) confirm the model of local geological structure as represented on the most up-to-date edition of the geological map of the Malé Karpaty Mts. (Polák et al. 2011).